This was a Kindle Daily Deal book. Of course it's a kid's book, a story for children. It seemed a little stark in some places for a kid, but what do I know from kid's books? Edward is the very definition of the passive protagonist, as he is a toy rabbit made of china and fur. He can't move or talk. All of the action in the book happens to him or around him, viewed through his thoughts. But this is the way of some children's books, so I guess that's OK. He's a bit of a smug prig in the beginning, which I found amusing. 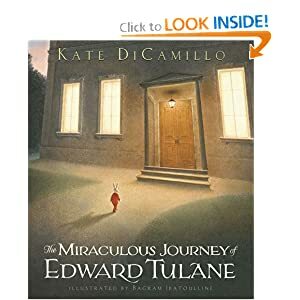 It's a nicely told story from the author of the Tale of Despereaux and Because of Winn Dixie. The illustrations by Bagram Ibatoullines are excellent. No table of contents, embedded or otherwise, for the Kindle. However, the left/right keys do move you back or forward one chapter. The Nook sample I downloaded had a TOC. In all other respects, it is a nicely done ebook. Oh you know, the usual. Writing novels, scotch, cigars, traffic tickets.